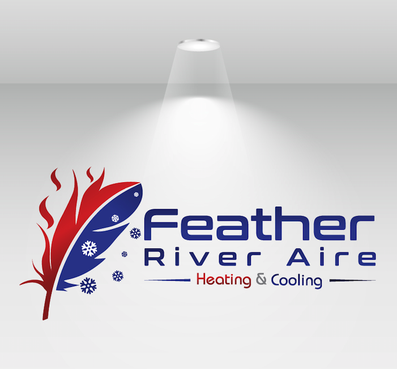 Residential & Commercial Heating, Air Conditioning and Ventilation Services - Feather River Air, Inc.
No other single system in your home or business plays a larger role in your comfort or how much your utility bill will be than your heating system. We specialize in cost-effective high-efficiency heating solutions, including natural gas, oil and electric furnaces, boilers, and gas and electric heat pumps. We also provide annual maintenance agreements and energy audits of your heating system to evaluate its efficiency. In climates like ours, a high-efficiency central air conditioning system can keep your whole house comfortable while keeping utility costs low. If you want cleaner, healthier indoor air, we will help supply and install the latest air filtration systems, air decontaminating UV lamps, dehumidifiers and humidifiers. People spend the majority of their lives inside their homes and buildings. Clean indoor air with low levels of dust, particulates and contaminants and the right level of humidity is more important for day-to-day health and comfort. 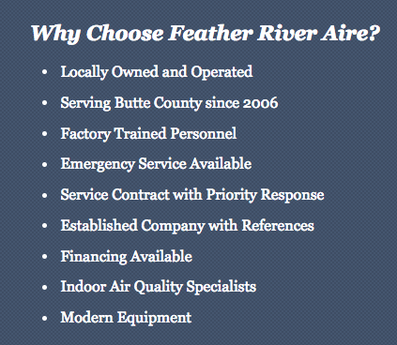 We also provide professional air and dryer duct cleaning.